Last night, I attended, as part of Yuri’s Night festivities, a public panel discussion related to the 5th International Workshop on Lunar Surface Applications. Sounds like a mouthful. What was it for? Think about the last time human beings explored another world. Okay, you might be too young for that. It was during the Apollo program, 1969-1972. Before we sent astronauts to the surface of the Moon–the first time that had ever happened in human history–we had to give the men in the lunar lander some idea of what to expect an how to react. Exploration is risky because people die from unexpected hazards: uncertain ground, strange creatures, bad weather. So the astronauts were prepared in a variety of ways, from spending days and weeks at a time in a cramped flight simulator to hanging them sideways with bungee cords to help them feel simulated lunar gravity to trekking through the wilderness for survival training. Each of the individuals on the panel discussed their experiences at these habitats, each with its own level of realism to simulate (or create analogues of) specific aspects of space exploration. 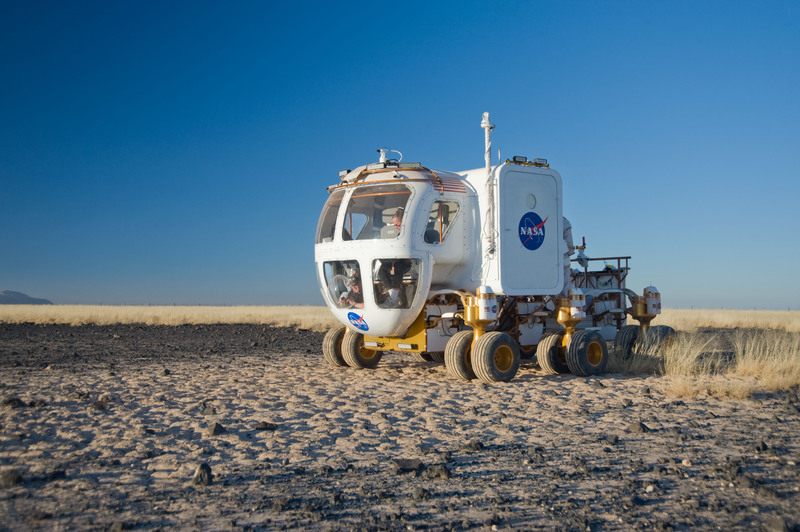 Since 2009, NASA has been operating 7-10-day simulations for lunar exploration hardware. Jason Schuler, a robotics engineer at Kennedy Space Center, has participated in KSC’s “Swamp Works” team, which contributes to the effort. They send a group of engineers and astronauts (or NASA people who would like to be astronauts) to work with prototype or simulated crew habitats, vehicles, and field equipment. The simulation area is often terrain that resembles the Moon or Mars, such as lava flows, craters, or deserts. The “crew” have to live in close-quarters habitats and wear “spacesuits” when they go outside, just as they would on the Moon. They try to perform specific tasks, such as conduct science experiments or build a spacecraft landing pad. They also experience simulated “emergencies.” During one such drill, a two-vehicle mission crew had to cram into one vehicle and spend the night inside one vehicle. Way up in the thin, dry, non-tourist-friendly parts of Mauna Loa on Hawai’i’s Big Island, you can find the Hawai’i Space Exploration Analog and Simulation (HI-SEAS). Here, in the shadow of the world’s tallest mountain (base to summit, taller than Mt. Everest), Mauna Kea, NASA has built a simulated Mars base. Here, participants go through a competitive process akin to astronaut down-selecting before they ever get to join: personality tests, physicals, survival training, psychological testing, etc. Once there, they are signed up for 120 days or more. Like Desert-RATS, the crew must put on a simulated spacesuit to step outside. They experience a 40-minute communication delay, which is similar to the light-speed delay that would happen at Mars. Quarters are cramped, but the science and engineering goals are real. Annie Caraccio, a KSC chemical engineer, spent her four-month stint on top of Mauna Loa working out ways to reduce or reuse waste on space missions. On the International Space Station, you can wad up trash into football-size packets in plastic bags and drop it into the atmosphere, where it burns up upon reentry. That option is not available on the Moon or Mars. So what do you do with it? Annie was looking into using some of the waste as fuel for a reactor of some kind (think Mr. Fusion on the back of the DeLorean at the end of Back to the Future). 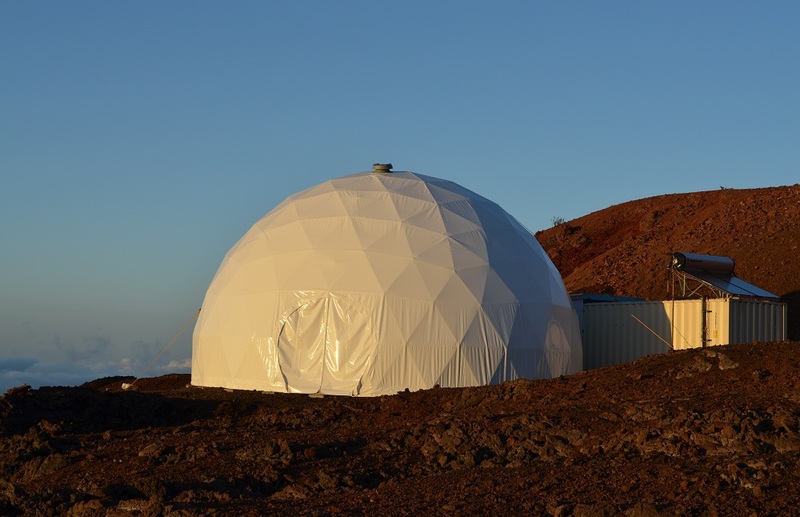 She and her team also poked around the Mauna Loa summit for lava tubes, which could–on the Moon or Mars–be used to house habitats sheltered from radiation. Despite all this focus on technology, HI-SEAS actually started as a psychological study, focusing on things like cognition, group cohesion, biopsychosocial behavior (whatever the heck that is), and individual adaptation in an isolated, time-delayed environment. These are aspects of long-term space exploration that we need to study now. 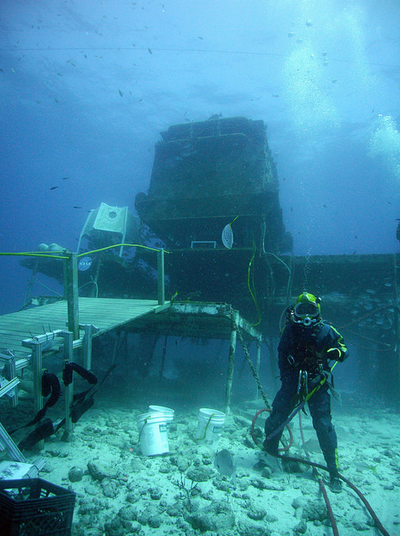 One environment that closely resembles many aspects of space exploration is underwater. Submerged five miles off the southeast coast of Florida, the Aquarius Reef Base serves as a long-term underwater lab for simulating exploration. Crew members use saturation diving, in which divers’ tissues are saturated with nitrogen. This allows crew members to work underwater longer. The risk of the bends is less, but it takes 17 hours for them to decompress before they return to the surface. Swimming underwater is akin to weightlessness–NASA uses it to train its astronauts. Being in a pressurized steel can for days or weeks at a time is akin to being in a submarine or a spacecraft. Again, the crews are doing actual science. Unlike HI-SEAS or the Flashline Mars Arctic Research Station (to be discussed shortly), communications are real-time, and the crew have wireless internet. Once a NASA program, Aquarius is now managed by Florida International University. Since 2001, the Mars Society has been operating a Mars mission simulator in the most Mars-like environment they could find on Earth: Haughton Crater on Devon Island, in the Nunavut Province of Canada. How realistic is it? 75 degrees North latitude, an arctic desert, with a massive meteor crater, an temperatures that can drop to -40 degrees (“Fahrenheit or Celsius,” Ryan quipped. “It doesn’t really matter at that point”). Communications–especially internet–are delayed 20 minutes. Given that the teams operate in polar summer, the sun is up 24/7, allowing them to simulate a polar mission on Mars. The habitat is a two-story “tin can” akin to a spacecraft Mars Society President Robert Zubrin postulated in his 1996 book //ws-na.amazon-adsystem.com/widgets/q?ServiceVersion=20070822&OneJS=1&Operation=GetAdHtml&MarketPlace=US&source=ac&ref=qf_sp_asin_til&ad_type=product_link&tracking_id=rheroc-20&marketplace=amazon&region=US&placement=145160811X&asins=145160811X&linkId=PENKBLATKBUPWLBS&show_border=true&link_opens_in_new_window=true“>The Case for Mars. The mission participants–who will go anywhere from two weeks to four months–wear simulated spacesuits, of course, though they also have an observer with them who is wearing simple arctic winter gear…an a rifle, in case there’s a polar bear nearby. But here, again, the teams are doing engineering work or performing field science, such as drilling for cores of the permafrost. Ryan’s team even simulated a Martian “day” for a month, adding 39 minutes to their day. After a week of feeling jet lagged, they learned to like it, as it gave them more time to work. The Mars Society also runs a Desert Research Station in the high desert of Utah, where crews going to Devon Island spend a couple of weeks training before they head for the frozen north. And yes, they follow the same rules as they do on Devon Island, but if there’s a problem, help is closer to reach. The closest airport is an hour away from the arctic station, assuming the airport is operating and has a plane available. The obvious star of the evening was Cady Coleman, a NASA astronaut who has done Space Shuttle missions and a tour on the International Space Station. She was fascinated by the Earth-based simulations and interested in doing a couple of them herself (she’s been on the NEEMO mission on Aquarius). But obviously she was one up on everybody, as she’d actually spent three months on ISS in space, which is the point of all these Earth-based exercises. Coleman also has spent time in Antarctica, on the other side of the world from Devon Island, collecting meteorites. Her insights were worthwhile, with most of the audience members curious about crew dynamics–how people got along–on the Station. In the end, I suppose, that curiosity is inevitable: human spaceflight is all about humans going out and doing things out on the frontier. If we were only going to send robots, the question of how people get along wouldn’t come up because robots just obey orders. We humans can be a cranky lot, especially when we’re in a strange, unfamiliar, or uncomfortable environment away from many of the support systems we take for granted here on Earth. While NASA doesn’t exactly hide the potential downsides or conflicts that can occur among ISS crews, they’re inevitable. Coleman, diplomatically, explained some of the social work-arounds that her crew developed. For example, one of her Russian crewmates “clearly had never worked with women before” and would not answer any of her questions unless she got very insistent. 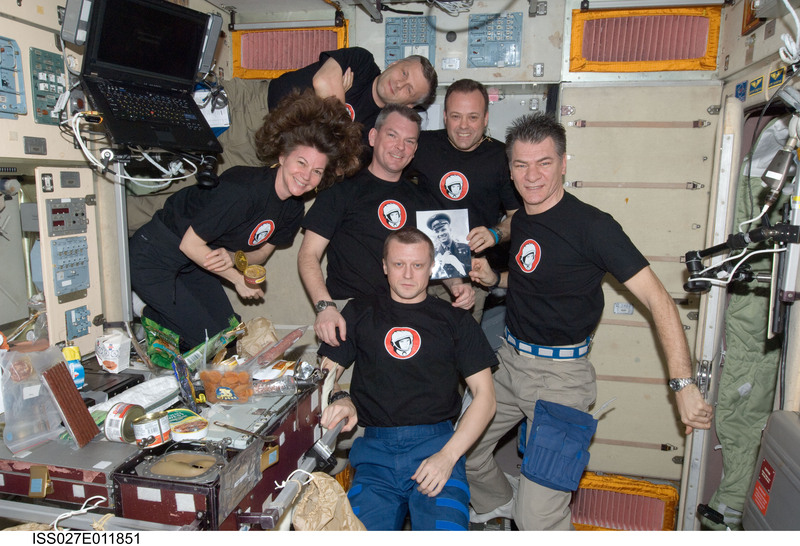 The work-around became: the other Russian astronaut would often have the same question Coleman did, so he would ask his compatriot the same question, and they would get the answer that way. Coleman also mentioned some friction she experienced while hunting for meteorites in Antarctica. She was getting cranky about things one of her crewmates was doing, but then stopped herself, realizing where she was. In Antarctica, as in space, she said that “the mission is so compelling,” it overrides most of the minor social issues.